Michael McCrudden will be taking the captain's armband at Drumahoe next season. Institute manager Paddy McLaughlin has appointed Michael McCrudden as his new captain. After Stephen O’Donnell departed for Coleraine, the Waterside men had to appoint a new skipper and McLaughlin feels the 25-year-old is the perfect man for the job. He really is leading by example, he’s first in the door and last to leave and his performances so far have been top notch. “Mickey is ready for the responsibility, he has been with us for a number of years and he was captain last year, so I feel he’s the right man to take the captain’s armband,” stated McLaughlin. “While Michael is still a young man in terms of his age, but there’s no doubting his experience and quality in the game. He has been at quite a few big clubs like Newcastle United and Derry City. “He has been at ’Stute now for a couple of years and he’s one of our more experienced players and is a player that our younger boys will look up too. “I feel giving him that wee bit added responsibility has brought him on massively, even over the last couple of weeks. In pre-season, he really is leading by example, he’s first in the door and last to leave and his performances so far have been top notch. Institute play their final pre-season game of the season at Premiership side Dungannon Swifts, this Saturday (KO 3pm). 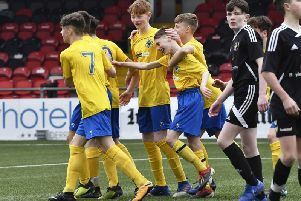 Having defeated Derry City U19’s 4-1 on Tuesday night thanks to a brace from Kyle Curran Friel and a goal apiece for McCrudden and Stephen Curry, boss McLaughlin wants his players to put in another big shift at Stangmore Park. New signings Eamonn Seydak and Caoimhin Bonner are likely to feature again and McLaughlin is hopeful of adding to his squad before their league opener at Dergview on Friday August 11th (KO 7.45pm). “Look like every manager I want to strengthen my squad but we’ll have to wait and see,” he added. “The boys I have already brought in have all settled in well and so far in pre-season they have been superb. “We play Dungannon on Saturday and yes it’s our final game before the season, but I remind all the players in every session and every game that they play, to keep the intensity and quality levels up, because they are working not just towards the starting eleven for the first game of the season, but for every game that you are available for. “Every player should want to be ready for every game, not just the first game. We want all the boys to do the right things now and getting into good habits.